Posted by AnnaTheRed in Everything else. Last Friday was the going away party for one of my co-workers at a karaoke place nearby work. But since it didn’t start until 8:00, my boyfriend, my friends/co-workers and I decided to grab something to eat before going to the karaoke place. The karaoke place was in Korean town in NYC, so we just went to one of Korean restaurants by the karaoke place. When the waitress brought my food, it looked so good that I took a picture of it. Looks can be so deceiving. I mixed it, and started eating. I mixed some more and ate some more. A couple of minutes after we started eating, my friend who was eating bulgogi asked my friend who was eating bibimbap. “So how’s your bibimbap?” She said “Well, it’s a little…” then she paused. So I finished her sentence with “…bland.” We had a “I’m so glad that I wasn’t only one thinking that!” moment. When I started eating, I couldn’t taste anything, so I mixed more, thinking that there was some flavor hidden inside. I kept on mixing and eating, waiting for the explosion of flavors, but it didn’t happen. It was like a puzzle from Professor Layton that’s worth about 99 picarats. “Where did the flavor go?” There was meat and so many vegetables in it, but you could taste NOTHING! My friend put a little bit of salt on it, I even tried dumping a bit of the sauce that came with pa jun (Korean pancake) on it. But anything you put in, it was quickly absorbed by the mass of flavorlessness! My boyfriend usually helps me finish my dish when I can’t eat it by myself, but he couldn’t even finish the two spoonfuls of my bibimbap. My other friend who also ordered bibimbap said if I put a lot of hot sauce in it, it’d be fine. But I refused to numb my mouth just to eat the flavorless mushy rice. It didn’t taste bad, it just had no taste whatsoever. 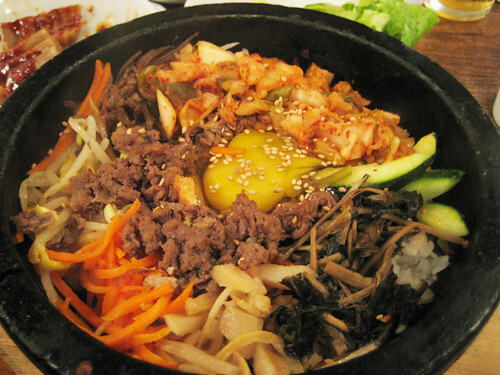 I’ve never had a bibimbap like this one before, and I’m not a picky eater or harsh food critic at all. I wasn’t angry or anything though. Actually, it was so tasteless that it was funny. We spent long time talking about how it was possible for something packed with so much food to taste so bland. I still didn’t want to waste it, so I took my leftovers and my friend’s leftovers home, and I decided to make rice croquettes with it tonight. I didn’t feel like deep frying, so I used a toaster oven this time. I mixed the bibimbap with a little bit of ketchup and parmesan cheese, made small rice balls using plastic wrap. 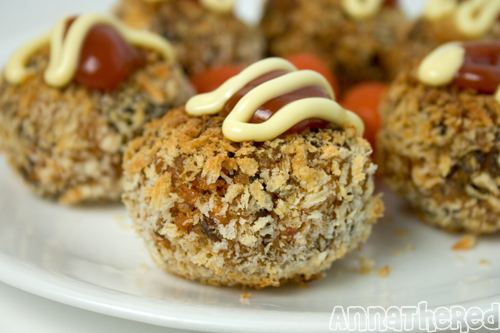 Then I put mayonnaise on plastic wrap, rolled the rice balls over, and put them in a bowl of panko. (Japanese bread crumbs) I baked them until they were golden brown. The outside was crispy and inside had much more flavor from ketchup and parmesan cheese. The inside was still a bit mushier than I wanted, but the crispy panko on the outside definitely helped. © Annathered Copying or redistributing without permission is prohibited.